A rendering of The SoNo Collection. NORWALK, Conn. – The rumored death of malls make for good conversation in Norwalk. News articles about the decline of brick and mortar retail are routinely posted on Facebook; links are forwarded by email. The skepticism includes a Bloomberg news article sent last week to NancyOnNorwalk, with the headline, “Malls ‘Will Never Be the Same’ as Retail Gloom Triggers a Reboot”. 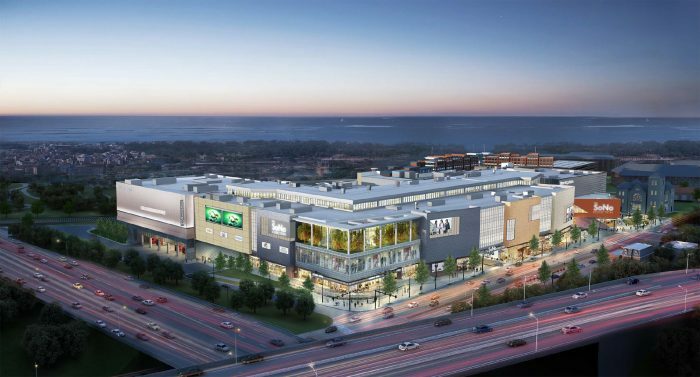 The story leads with the news that GGP has allowed its Lakeside Mall, outside Detroit, to be foreclosed on. GGP CEO Sandeep Mathrani, in last week’s earnings conference call, called that “consistent with our strategy of continuously pruning the lower quality of our portfolio,” according to a Seeking Alpha transcript. Bloomberg’s story about the death of malls explains that options for the ill-fated Lakeside Mall include apartments, hotels or restaurants. As an example of the shifting landscape, Bloomberg quotes Mark Toro, a partner at North American Properties, as saying that the company’s plans for an 85-acre development outside of Atlanta have changed repeatedly since 2011, morphing from its original shopping center vision to residential uses along with office space and a conference center. “We concluded that shopping centers are dead and gone, and the only way to create value in retail real estate is to fabricate a street experience,” Toro is quoted as saying. The Palisades Mall is thriving because it is a destination. GGP isn’t in this to lose money, but as The Norwalker points out they have a healthy portfolio. Meaning, they are willing to take many bets, knowing some will prosper and some will fail. Loews main purpose here is to put a dent into one of the more successful Home Depot stores. We also have 2 Walmarts, not for profit, but to keep Target and others out of the city. These are risk measures that don’t necessarily help Norwalk. That said, if they put somethings to attract more than just retail shoppers to the mall, it will do fine…..if you can suffer the traffic to get to it! GGP has a thriving mall in Virginia, Tysons Galleria. Down the road is the Merrifield Center, which bills itself as a lifestyle concept. The shame of the GGP plan for Norwalk was the loss of the mixed use requirement. Perhaps GGP is now of a mind to reconsider mixed use. Sorry. Merrifield is a reinvented Virginia suburb just outside D.C. Mosaic District is the name of the lifestyle concept mall in Merrifield. It is fully mixed use. Mosaic District is a pretty good example of how the old full retail mall concept can be adapted to thrive in the 21st century. The idea is to create a town within a town and a destination. I’m not sure the current iteration of the SoNo Collection does either. Maybe they’ll ask for a concept do over. It sounds like straight retail malls are a dated concept. There will be a last mall built somewhere in america. Maybe it already has been built? The ones locally are filled with problems ,its obvious GGP isn’t highlighting the two deaths from failing railings and parking lot assaults Maryland has a host problems that could be outdone once Sono opens where was Norwalks research on any of this? Im not a fan of GGP but became an investor to read between the lines,if your interested the stock is falling to a all time low ,buy some and tell us later about the plus side of GGP. You dont have to hurry stock hasnt been this low in two years. The CEO of GGP has dumped millions of dollars of stock within the last 6 months maybe he knows something we don’t . We could start with the Providence mall and one in Ct they own ,dont do to GGP go to your local police and health departments and see how great their malls are. Facts can be a turning point when looking into any company on the brink of bankruptcy. I suggest to wander off GGPs site . GGP is down another 45 cents today ,they have been bleeding all year this week has been a transfusion type bleed. Does anypne in Norwalk understand high end malls contain more than one anchor low end are dying off first. Norwalk is not high end ,what part of this escapes Norwalkers? So who is the partner in Norwalk with GGP Rilling or Fowler or both ?